Last summer we made a spur of the moment decision to go to Smugglers’ Notch Vermont on vacation. Vermont may not be the first place that comes to mind when you think of summer vacation. But we live at the Jersey Shore, land of summer vacation, and for us traveling to another beach town in the summer just doesn’t make sense. And honestly, by late August I’m so sick of the Jersey shore. So we headed to Vermont where the daily average was in the low 70’s and we woke up to a beautiful 45 degrees in the morning. The mountains, in the morning with the clouds sliding across them, may rival any early morning at the beach. And the mountain air, well I swore it was magic because my kids slept. 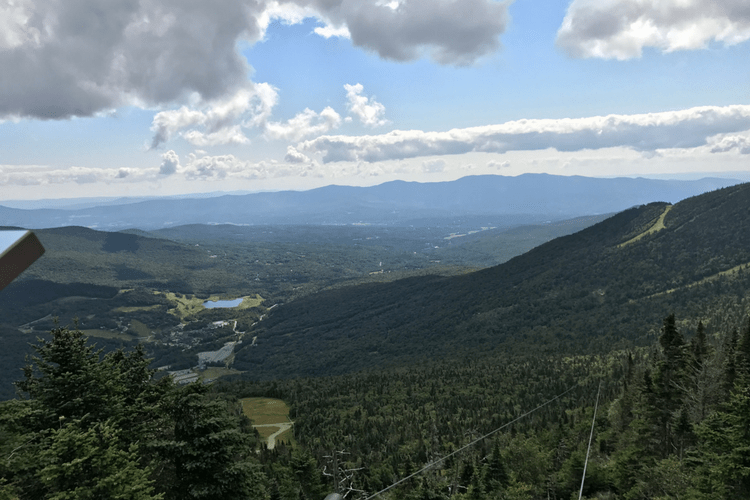 When people think of Stowe, Vermont they naturally think of skiing and while you won’t be skiing in the summer, there are still plenty of amazing things to do when you visit Vermont in the Summer. If you a thrill seeker you can zipline down Mt. Mansfield in the summer. We watched a few people take the plunge and while I initially didn’t think I would want to do it, I might be adding this to my to-do list for our next trip. Smugglers’ Notch Resort offered a wide variety of activities for families, kids and adults. We choose the wine and kayak tour a 3 hour adventure where you kayak down the river to the Boyden Valley winery for a wine tasting and cheese plate. The kayak trip was easy enough for beginners but still lots of fun for those with more experience. 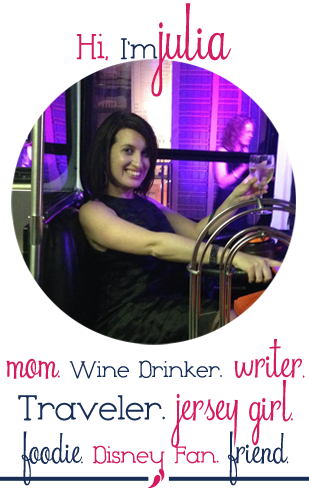 The wine at Boyden Valley winery was excellent. The Big Barn Red, Riverbend Red and the Rose were our favorites. We also loved their ciders and highly suggest you bring back some of their maple syrup. 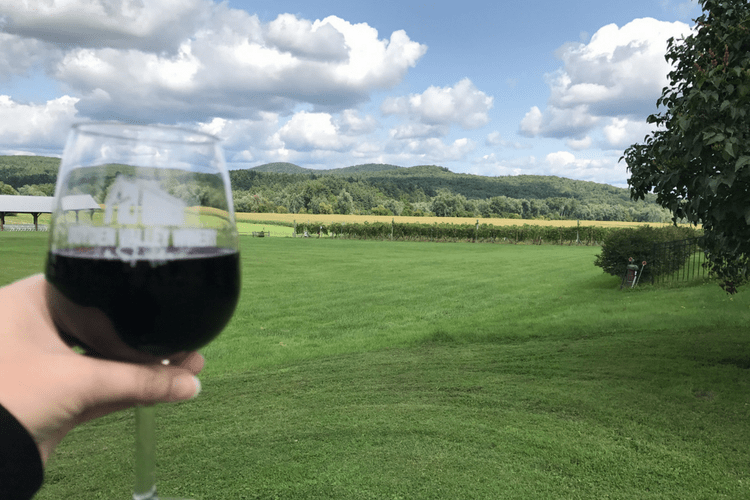 After your wine tasting, you have some time to enjoy a glass of wine on the patio before a van picks you up to take you back to where your kayak adventure started. 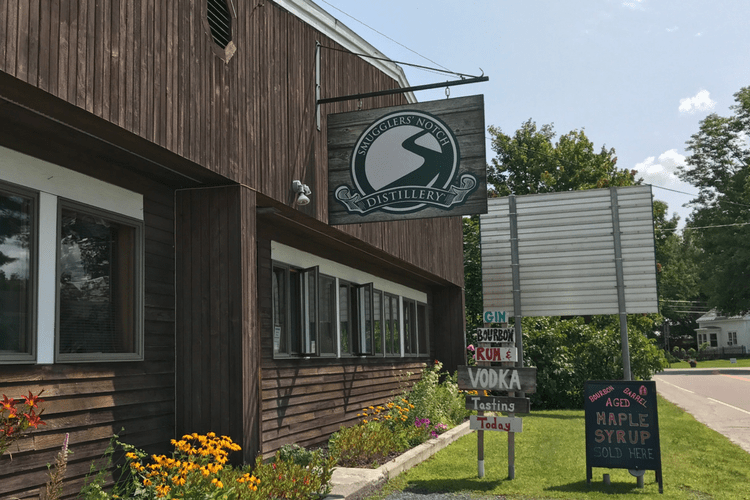 The Smugglers’ Notch Distillery is one of the best we’ve visited. We liked everything we tried and their Litigation Wheat Whiskey is perfect on its own or in a hot toddy. Stowe, Vermont located right outside of Smuggler’s Notch Resort has a variety of breweries to visit including the legendary Alchemist Brewery. In the summer the mountains are lush with trees and green. Perfect for taking in in the scenery, walking or hiking. On our trip, we took a gondola to the top of Mt. Mansfield. It’s a great way to get an aerial view of the mountains and a time-saver if you aren’t up for hiking it. At the top the views are breath-taking, you can see all the way to the highest mountain peaks in New Hampshire. Make sure to eat at the restaurant and savor the view. You can also hike to the summit from there. Ride the Water Slides or Go On a Llama Trek. Smugglers’ Notch has 8 pools, 4 water slides and 2 freshwater reservoirs making for lots of summer fun. They also offer a wide variety of water sports like paddle boarding, kayaking or go flyboarding. If the water is not your thing don’t worry there is also mini golf, mountain biking, geocaching and Segway tours. Or take a hike with a llama, the options are endless. Smugglers’ Notch has incredible children’s programs that will keep your kids happy, entertained and having fun for your entire stay. Both of our kids spent their days in camp on our trip. They got to make friends and spend time with kids their own ages and do age-appropriate activities. My son got to visit the waterslides and go on hikes. While my 1-year-old daughter played at the playground and enjoyed Treasures childcare facility which was clean, friendly and full of activities for little ones. The staff was better at doing her hair than I was. Vermont is known for Ben and Jerry’s ice cream. You can even take a tour of the factory if you venture about half an hour from Smugglers’ Notch Resort. Or you can simply enjoy a Ben and Jerry’s ice cream at the Ben and Jerry’s ice cream parlor at Smugglers’ Notch. My son wanted to stop in every day of the trip. 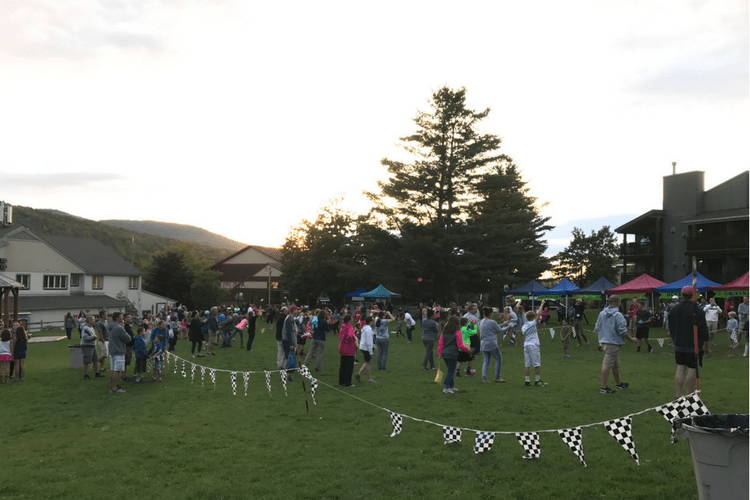 Smugglers’ Notch hosts a Vermont Country Fair on Thursday nights on the main lawn. There were go-kart races, games for the kids and plenty of opportunities to purchase local Vermont goods. I grabbed a bottle of Boyden Valley Wine which paired perfectly with some Vermont cheddar and pepperoni. The Farmers Market runs on Monday mornings and features local fruits, vegetables, and other products. We visited Smuggs in at the end of August, shortly after we returned from Orlando. To say that we were done with excessive heat and humidity is an understatement. The temperature was in the low 70’s in Vermont and got down into the low 50’s at night. It was gorgeous. Perfect for hiking, exploring and savoring a glass of wine on the deck at night. 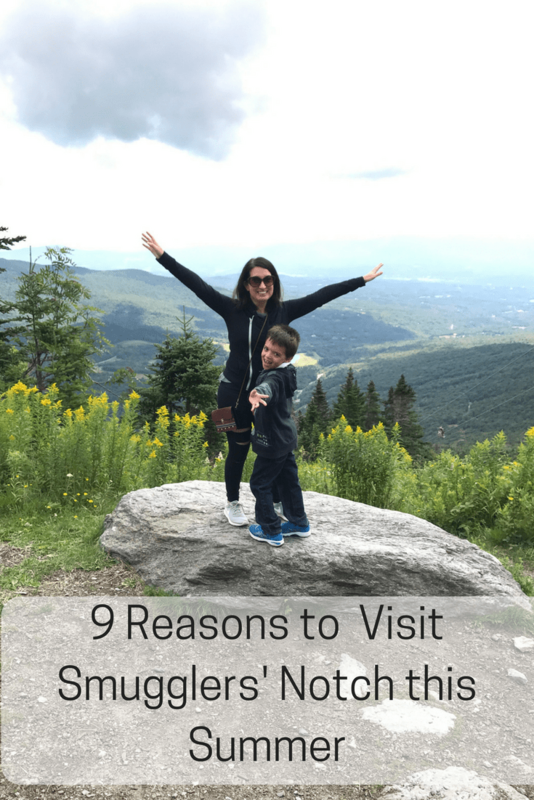 Our trip to Smugglers’ Notch last summer started out as a whim because my son wanted to go to Ben and Jerry’s but it ended up being one of the best family vacations we have taken.